Every year, filmmakers get to put in their films to a range of film festivals in the hopes of having recognition they truly deserve. Things even get any better if their films draw the attention of festival curators or an influential audience. Film festivals no doubt have paved the way for many of today’s iconic filmmakers. In addition, the festival setting allows both festival curators and audience to share their most inner thoughts and ideas with the filmmakers, panelists, or other audience members to gather new perspectives. In Russia, there is the most-celebrated film festival called Moscow International Film Festival (MIFF). It celebrates the rich Russian culture, including religion and history. There is also a vibrant mix of music, film, and theatre. In this article, we are about to learn more about Moscow International Film Festival (MIFF). So, without further ado, here are 8 glamorous facts of Moscow International Film Festival (MIFF). Moscow International Film Festival (MIFF) was observed in 1935 for the first time when the grand jury was made up by the world-renowned filmmaker named Sergei Eisenstein. After that, the festival became an event that was regularly held on the cultural calendar in 1959. There were about 200 films from 50 different countries that were screened at time. On the 40th celebration of Moscow International Film Festival, there was a slight bittersweet note in it. The late Oleg Tabakov, a great actor as well as director and master won a very special prize which is Golden Saint George for his amazing contribution to the world cinema. Unfortunately, he was passed away, and thus, it was awarded posthumously during the festival. The prize was received by his son, Pavel who is also a talented young artist, definitely the successor to the great dynasty. In some way there’s a whole group of people who can be called the “successors of the dynasty”, as for Tabakov himself managed to mentor him. It was one of the very rare occasions when there was no need to draw upon traditional phrases about the memory of the late person. The late Tabakov is now universally known and loved, and whose kind-heartedness, outgoingness, and warmth were well known to everyone. 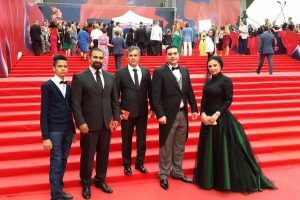 Still on the 40th celebration of Moscow International Film Festival (MIFF), the festival was also focusing on Sri Lankan cinema in a very notable period. The Sri Lankan cinema had the imprint of the society, moment of history, and culture that brought acknowledgment to it. From the capitalist infra-structure, to the urbanization of both culture and consciousness, to the encounters with cultural modernization and tradition, to the crystallization of the idea of the nation state; they are all crucial to the birth of Sri Lankan cinema. When you are travelling to Russia, there are many hidden spots that you may miss while looking for engaging and authentic attractions. And one of them is Moscow International Film Festival (MIFF). Things get even better when you are a films connoisseur, because Moscow International Film Festival (MIFF) is a true platform for the expansion and recognition of artistic talent. Since it is held annually during the summer season, it sure is an interesting attraction while Moscow in the warm months. Speaking of summer season festivals in Russia, do not miss out the White Night Festival as well as the places to celebrate it. Who does not know Tim Burton? Tim Burton is a story-board artist, concept artist, and animator for Disney and is well known for his work on Batman movies. He received the honorary prize for an outstanding contribution to the world cinema on the 34th celebration of Moscow International Film Festival (MIFF) in 2012. At that time, the grand jury for the competitive portion included internationally renowned actors and directors from all over the world. The mission and objective of Moscow International Film Festival (MIFF) is to encourage cultural changes as well as mutual understanding among countries and also to develop further collaboration among filmmakers all over the globe. The festival program only puts in films which have not been screened on the territory of the Russian Federation publicly, with the exception of retrospectives and the program of Russian films. Moscow International Film Festival (MIFF) will be held in April 2019, meanwhile the previous festival was held in June. Moscow International Film Festival (MIFF) was pushed to April due to the organization of the World Cup, which will be held in Russia from June 14 to July 15. According to the forum’s press service, Moscow International Film Festival (MIFF) will be held in Moscow on April 18 – 25 this year. They will hold a contest for short films and some contests of documentaries, along with shows of the best foreign films and also retrospective shows. The grand jury for the festival comprises of professionals whose opinion is valid in today’s era of such varied backgrounds, such as experimental film, contemporary art, and contemporary theatre and dance. For your information, there is another award ceremony in Russia especially for art performances called The Golden Mask Festival. They also invite foreign guests and Russian connoisseurs in the hopes of bringing a wider range of attendees. So, those are 8 glamorous facts of Moscow International Film Festival (MIFF). Moscow International Film Festival (MIFF) is an amazing opportunity for you to broaden exposure for your film and also for you as an amateur filmmaker. So, if you are traveling to Russia this summer, make sure you join in the festival. However, always be careful, because the entire festival experience can overwhelm you or even leaving you feeling like you have not achieved anything.